Application integration holds so much more benefits than just syncing in work processes. It can be as simple as connecting your CRM to a marketing automation platform. 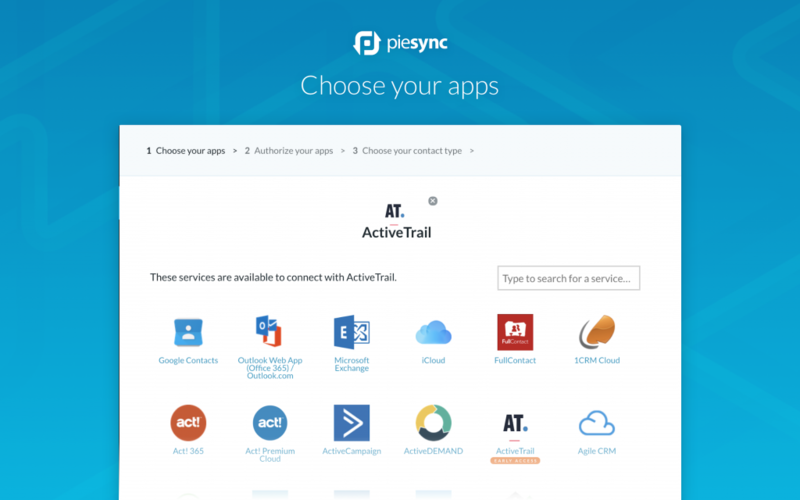 PieSync helps you connect business applications to your ActiveTrail contact list. 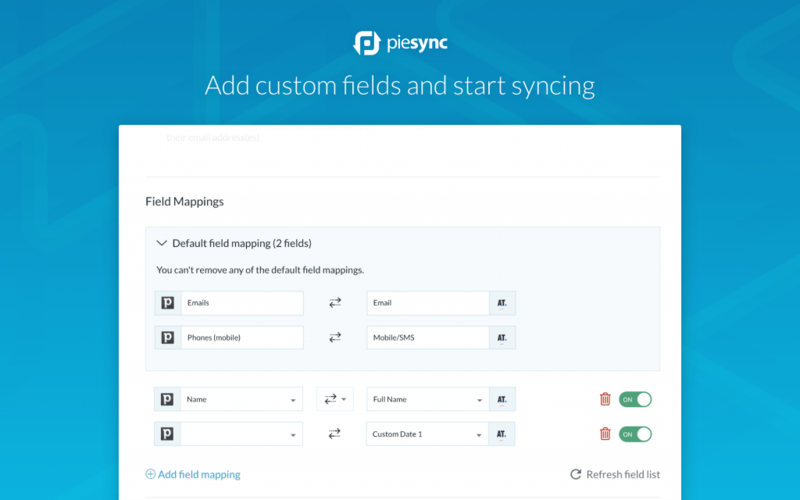 The PieSync integration with ActiveTrail allows you to solve your isolated data problems by personalizing your synchronization. Using PieSync will allow you to connect over 140+ applications to ActiveTrail without the need of a developer or code. 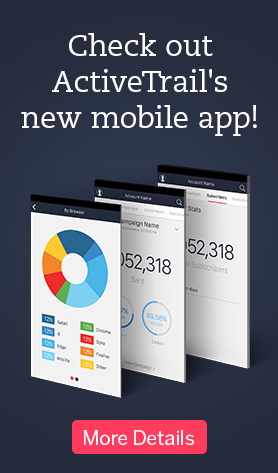 Applications are added every week so you can focus on your business while PieSync does all the data management for you. A 2-way sync is hard to near impossible to achieve when using traditional integration methods that rely on trigger/action principles. With PieSync, ActiveTrail can be synced up bidirectionally to 150 cloud apps with new apps being added to the sync engine every week. 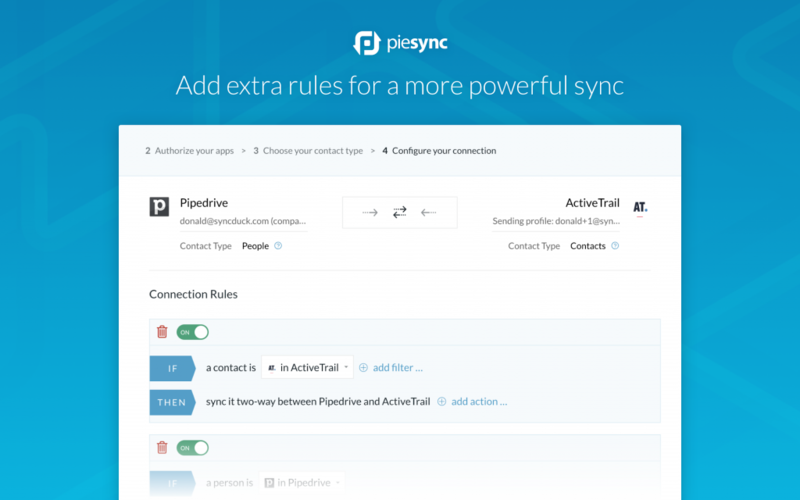 PieSync’s sync engine is app-agnostic so ActiveTrail can be synced up to other CRM’s, e-mail clients, invoicing apps, marketing automation engines, prospecting tools. The use cases are therefore quite diverse. Many point to point integrations exist already, several for ActiveTrail too. However, they each follow their own logic, layouts, sync schedules. In contrast, setting up rules & field mappings inside PieSync always follows an identical UX flow which builds confidence to the user wanting to integrate their entire SaaS stack using one single integration language. First, retroactive sync is performed: the engine will create those contacts on both sides of the sync that did not yet exist, as well as updating contacts that match between the two systems. Once the sync is active, it’s true 2-way sync which has changes registered wherever they happen. Contacts truly living in tandem. Syncing with Gsuite helps in establishing a caller id on smartphones since the Google Contacts database is constantly being filled up with ActiveTrail data, in real time all the time. 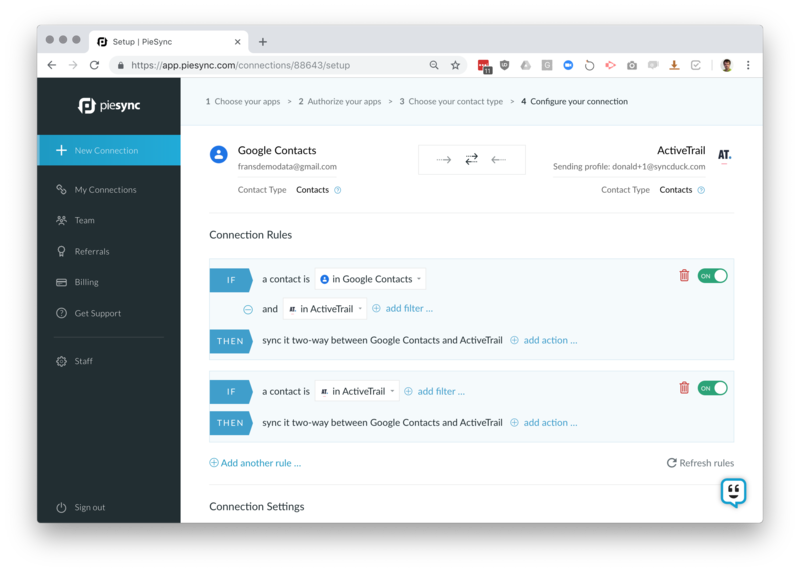 The ruleset illustrated above is an example where anybody existing in ActiveTrail will be created or matched up to contact in Google Contacts. In the other way round, a contact when added or existing into Google Contacts will only start syncing on the condition of it being present in the ActiveTrail database. In PieSync it doesn’t really matter whether it’s Gsuite, Icloud, Outlook, Exchange, FullContact, Nimble, … that runs on the user’s smartphone. Any app that a user wants to run on their phone will work. And setting this up doesn’t require knowledge of LDAP or complicated administration settings. ActiveTrail can only be as performant when the data contained in it is up to date. In the 2018 SaaS stack, the CRM is the logical source to be feeding leads & contacts data into ActiveTrail, but the same can be said for the other way round: a CRM can greatly benefit from a real-time, direct feed of marketing data coming from ActiveTrail. 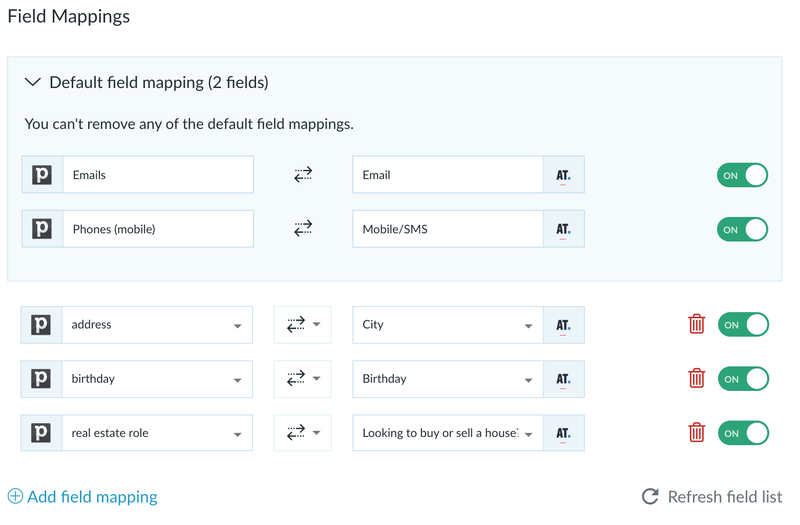 The CRM, Pipedrive in this example, sends contacts over to ActiveTrail but has them directly segmented in the right way by means of updating a custom field. If they happened to already exist in ActiveTrail – the contacts are updated, not duplicated. The sync offers immediate value in the other way round, from ActiveTrail to Pipedrive. New leads subscribing on a landing page, being nurtured, or on the receiving end of a great looking newsletter are constantly fed back into the CRM and labeled accordingly. Furthermore, PieSync assists in GDPR compliancy by syncing across op-ins and opt-outs. PieSync allows you to translate CRM properties into actionable marketing attributes for ActiveTrail, but in the other way round as well. Data collected or modified in the customer’s journey are fed back directly into the CRM’s custom or default contact attributes.